Simply the quickest path from ideas to results. SuperCard has been called difficult to describe. It is many different things to different users. One thing it is to all users, is a seasoned, rock solid tool, without the quirks present in other scripting environments. It allows you to quickly build software that works the way you do. From simple one trick ponies, information managers, a custom accounting system, classroom utilities and courseware, kiosks, or even a commercial idea that could make you famous. SuperCard has been used for all of these and more. Creating an interface is as simple as drawing it out. SuperCard uses an English based scripting language that is both powerful and intelligible. 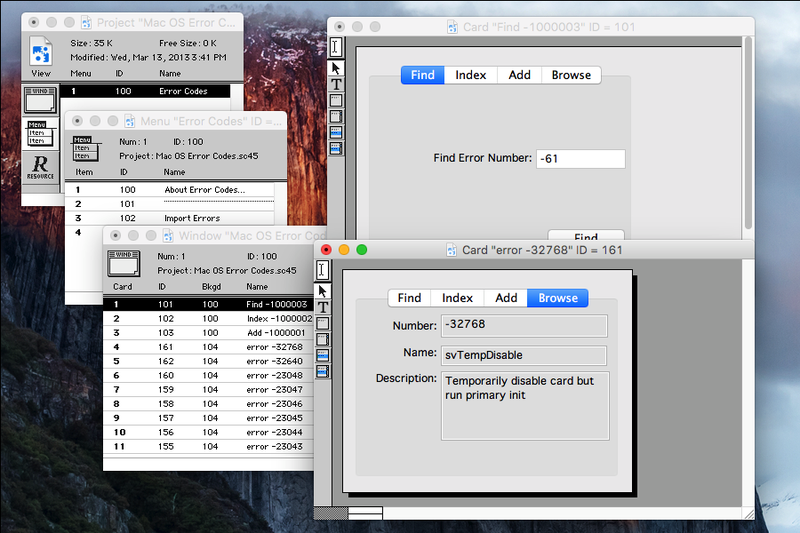 Share your projects with others using the freely distributable SuperCard Player. SuperTalk is one of the world’s most flexible scripting languages, allowing a nearly unprecedented degree of control over a wide variety of object and media types. Of course, every programming language can do this, but not in plain English. 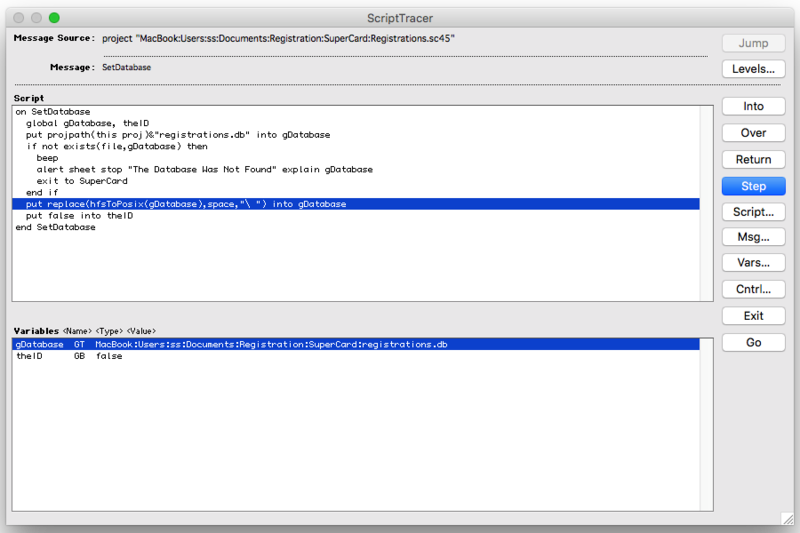 If you’ve scripted in AppleScript® or HyperTalk, you’ll find yourself in comfortable territory with SuperTalk. If SuperTalk is your first scripting language, you’ll find it easier to learn than most anything else out there. SuperTalk scripts make SuperCard respond to a user’s actions and to conditions in the SuperCard environment; buttons, fields, graphics, cards, backgrounds, windows, menus, menu items and projects, and the data contained in them. SuperCard’s standalone Help System makes it fast and easy to pick up on using SuperCard. Designed for quick, intuitive access to all of SuperCard’s installed help materials, it is the Language Guide that will undoubtedly be the most visited. Here you will find a comprehensive reference to all of SuperCard’s commands, functions, properties, messages, and other keywords, with each entry chock full of syntax examples, a comprehensive description, and cross references to related key words in the SuperTalk language. 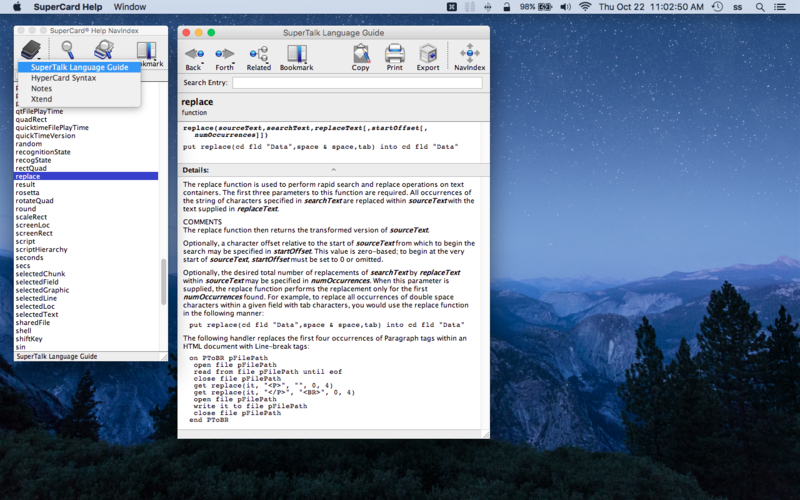 And it is all accessible directly from within the script editor, or exportable to an RTF tome for some away from your Mac, late night reading. 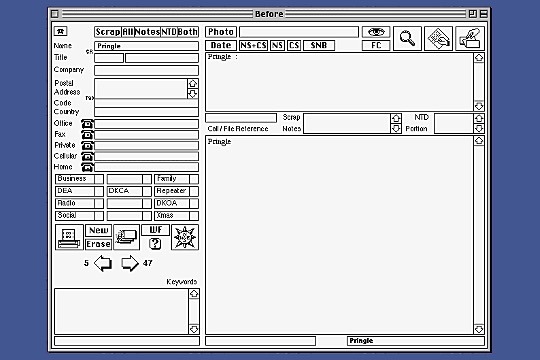 SuperCard's HyperCard Converter will quickly convert your HyperCard stack to a SuperCard project. All backgrounds, cards, card objects, their contents, and associated scripts are placed into a single window of a new SuperCard project. The ScriptTracer is an interactive debugger that lets you step through a script one line at a time while examining variable contents. You can also move back and forth through message levels, set breakpoints in scripts or on XCmd callbacks, change variable values, and execute commands via the message box. 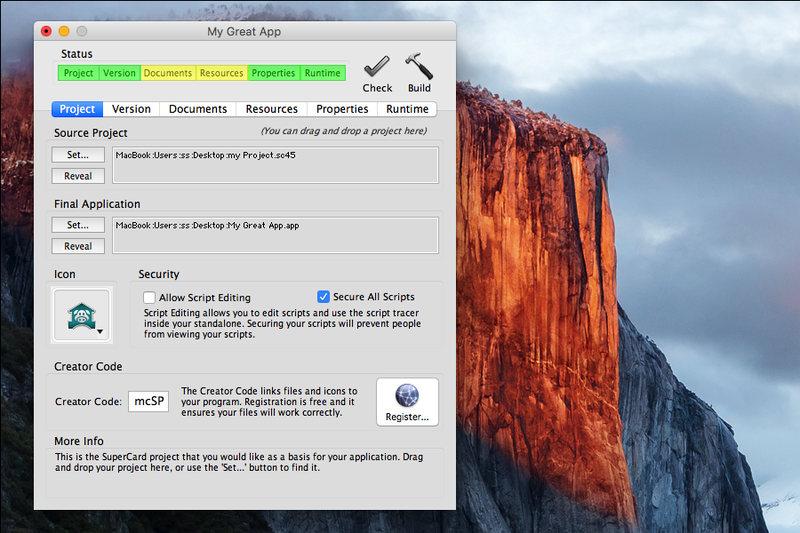 Included with the Suite, SuperEdit is a single-purpose editor where your scripts do not run. The many advantages of it are being able to copy windows and menus, change card order, assign cards to different backgrounds, and open multiple cards and scripts simultaneously. SuperCard Suite includes the ability to build professional quality, standalone applications from your projects. Set icons, version information, document associations, copyright info… even encrypt your scripts. All from an easy, point and click interface. Get started fast building fully commented scripts from an easy point and click interface. Run, compile, and save, and recall AppleScripts. Easily execute commands and functions in OS X’s UNIX shell. Extensive support for graphics, audio/video playback, text to speech and speech recognition. 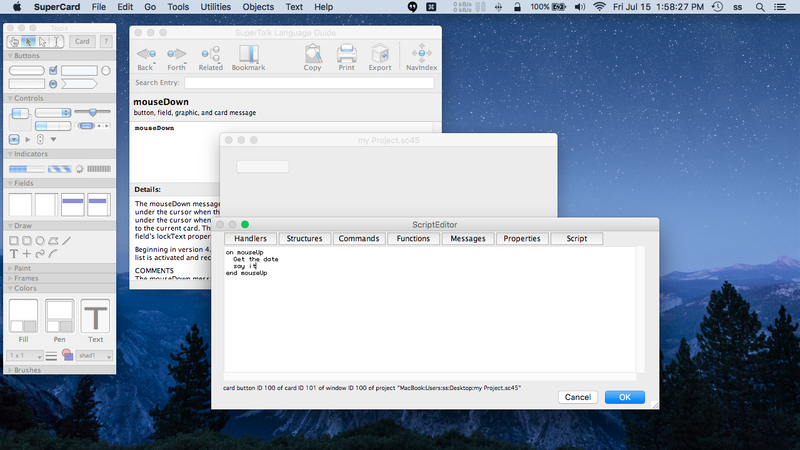 Your projects’ text and/or scripts can be fully searchable using Apple’s Spotlight. Preview a selected project card in Quicklook and Finder Coverflow views. SpellCheck function lets you use Apple’s multi-lingual spelling and grammar checking functions from SuperTalk.